Revealed: over 125k filed their US tax return with Sprintax in 2018! Every international student who studied in the US in 2017 was required to file a tax return ahead of the April 2018 deadline. A lot of international students find US tax to be very daunting. So filing a compliant tax return on time is, for many, no easy feat. It’s hard enough to come to terms with the tax system in your own country. But then, when you move to the US to study, you have to handle the US tax system too! Thankfully a solution is on hand. The easiest way for any international student to file a US tax return is to choose Sprintax. Sprintax is the only online tax-preparation software for non-resident in the US. The software assists students in preparing fully compliant Federal and State tax returns and retrieve their maximum legal tax refund. And all of this can be done in just a matter of minutes! Sprintax is the ‘go-to’ tax filing software for numerous major universities in the US including NYU, Columbia, Arizona State University, Illinois Institute of Technology and Cornell. In fact, we have helped students from over 1,500 schools and institutions from all across the US to file their tax return. Sprintax is also the non-resident partner of choice for Turbo Tax*. What are the benefits of using Sprintax? Today we are happy to introduce our ‘Tax Report 2018’. See the full tax report below. File your US tax return with confidence! File with Sprintax! When can I expect my tax refund? How long does it take the IRS to process an international student tax return? Have you ever wondered what happens to your tax return after you mail it to the IRS? Or how long it takes for the tax office to process your return? Many international students file their tax returns as quickly as they can in order to receive their tax refund as soon as possible. Yet once you mail your return, it can often seem like there is a long wait before you receive your refund. In this blog you’ll find details on exactly what happens when you mail your tax return to the IRS. Still haven’t filed your tax return? Just complete the registration form here to get started. What happens after I mail my return to the IRS? When you finalize your return and mail it to the tax office it will usually take several days to arrive at its destination. Keep in mind that it’s not unusual for something to go wrong with mail processing. For example, if you used insufficient postage your return can get sent back to you which will cause delays in receiving your refund. If you are mailing your tax return from outside the US, it will take even longer before it reaches the tax office. Tip: It’s always a good idea to mail your return using a certified mail service or an approved delivery service that will provide you with a tracking number of the letter and proof of your mailing date. Return Received/ Accepted – This status updates you that your return was successfully received by the IRS and is in line to be reviewed and processed. Usually it will take the IRS from 4 to 6 weeks to process a paper filed return. 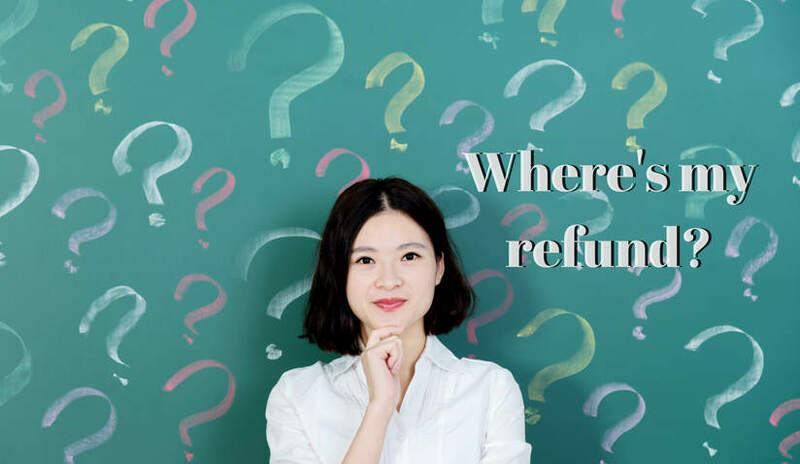 At this stage of the refund process, the IRS checks your return for math errors, verifies that your filing status matches your exemptions, checks how you’ve calculated your itemized deductions, and if you are legally entitled to any claimed dependents and credits. Refund Approved – This status means that your return was processed successfully and the refund amount shown on your tax return was approved by the IRS. At this stage your refund will be set for release either by electronic transfer or printed on a check and mailed to you via United States Postal Service, depending how you chose to receive your refund when filing your taxes. Refund Sent – This status indicates that your refund has been sent to you. It’s important to note that if you’ve requested to receive your refund deposited to your account, it could take approximately five days after they’ve sent it before it reaches you. This is because banks vary in how and when they credit funds. It could take several weeks before you receive a mailed refund check. In most cases, an approximate date to expect your refund to arrive will be indicated. Claim your refund with Sprintax here! How can I check the status on my refund? The IRS recommends using its online ‘Where’s My Refund’ tool (or the mobile app IRS2Go). The tool is updated once daily, usually overnight, so you don’t need to check it more often. You will get personalized refund information based on the processing stage of your tax return – it follows your tax return from receipt to completion. The tool will provide an actual refund date as soon as the IRS processes your tax return and approves your refund. What information will I need to check my refund status? Still haven’t filed? Prepare your return with Sprintax today! Note: If you’re requesting a refund of tax withheld on a Form 1042-S by filing a Form 1040NR, the IRS will need additional time to process the return. You should allow up to six months from the original due date of the 1040NR return, or the date you actually filed the 1040NR, (whichever is later) to receive any refund due. Is there another way to check the status of my refund? Yes. You can also call the IRS TeleTax System at (800) 829-4477 or the IRS Refund Hotline at (800) 829-1954. The IRS typically accepts calls Monday through Friday from 7am to 7pm (local time). Tip: If you decide to call the IRS, be prepared to be on hold for a while. In fact, the IRS says wait times average 15 minutes during filing season (January to April), with Mondays and Tuesdays being the busiest days. After filing season (May to December), waits can be even longer, averaging 27 minutes. What about the status of my State refund? Each State tax office follows a similar processing procedure. You can check the status of your State tax refund using the online refund status tools on each State’s website. More detail on how you can check the status of your State refund can be found here. I’ve left the US and am having difficulties receiving my refund, what can I do? 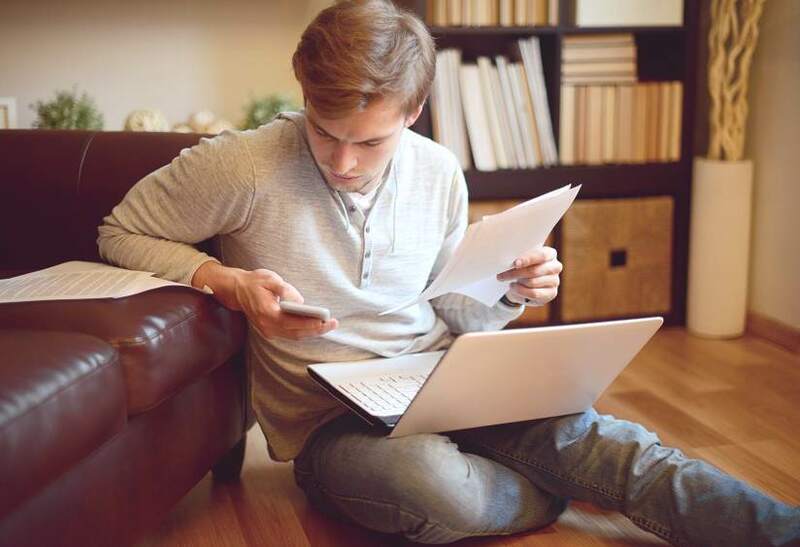 If you have left the US, for example after completing your college course or J-1 program, you may encounter some obstacles when trying to get your hands on your tax refund. The main reason for this is that cashing an American cheque outside the US can often be tricky. Sprintax can handle the cheque cashing process for you and transfer your money to your bank account anywhere in the world. What’s more, should the IRS request additional information before processing your tax return, Sprintax can handle all of the additional communication with the IRS on your behalf. Claim your US tax refund the easy way! Get started with Sprintax here. Sprintax – the easy way to file a J-1 tax return! When President Donald Trump introduced his ‘Tax Cuts and Jobs Act’ in November 2017, many J-1 visa holders and international students in the US were left feeling extremely confused. A lot of questions were left unanswered. Today we are here to answer these questions! If you’re going on a J-1 trip to the US simply follow this guide and you’ll be able to keep the IRS (the American tax authority) happy while receiving any US tax back you are due. Short on time? Check out our video summary instead! (1) Yes, you have to file a tax return! First things first. Every J-1 visa holder in the US must file a tax return at the end of the tax year. It’s the law! 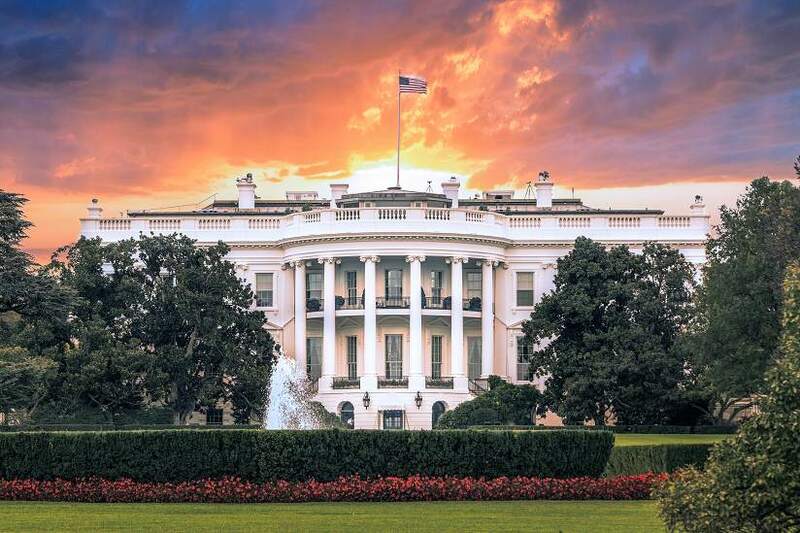 Prior to President Trump’s bill there were a limited number of circumstances in which a J-1 holidaymaker would not be required to file a tax return. This is no longer the case however, and one of the conditions of the J-1 visa is that the visa holder files a tax return. There are a number of ways to file a tax return. For starters, you could file your return directly with the IRS. But, for many J-1 students, filing a tax return is an extremely confusing, complicated and frankly boring task! The fastest, easiest and best way to prepare your US tax return is to choose Sprintax. More on this below! If you don’t file a tax return after your J-1 program, you may be subject to penalties and interest. The late filing penalty is 5% of the additional taxes owed amount for every month your return is late, (up to a maximum of 25%). If you file more than 60 days after the due date, the minimum penalty is $205 or 100% of your unpaid tax, whichever is less. Failure to comply with your tax obligations may also result in you being denied a US visa in the future. 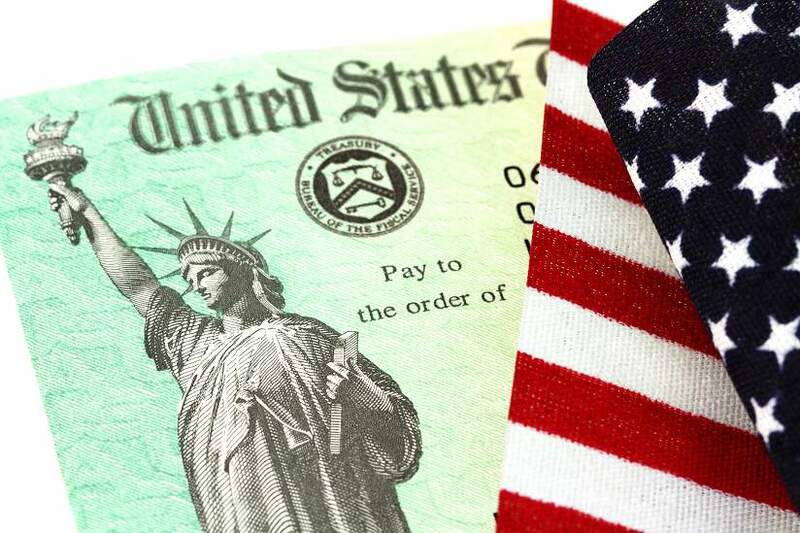 What is a tax residency status? It’s vital to determine your residency status in order to file a compliant tax return. The majority of J-1 visa holders are considered non-resident aliens for tax purposes by the IRS. When you prepare your tax return with Sprintax, our software will determine your residency status based on the information that you provide. 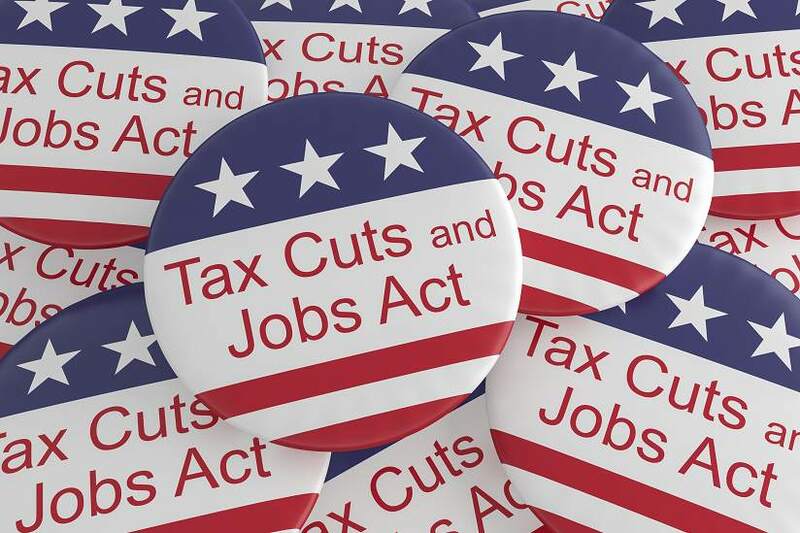 The ‘Tax Cuts and Jobs Act’ has wide ranging effects for all US taxpayers – but particularly for those venturing to the States to study, for an internship or to work and travel. 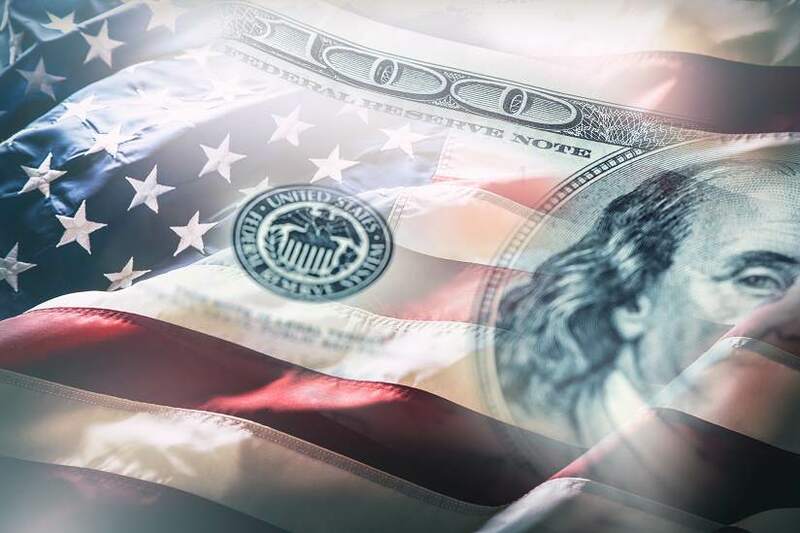 As most of these changes were activated in January 2018, it’s vital that all non-residents understand their US tax obligations and entitlements. The primary change for non-residents relates to what’s known as the ‘personal exemption‘. Prior to the bill’s introduction, every non-resident who was working in the US was entitled to a personal exemption of $4,050. In other words, if you were working in the US on a J-1 visa in 2017 you could earn up to $4,050 without paying tax. The personal exemption was also the main means that non-residents could use to get their Federal tax refund. However, as of 1 January 2018 (and up to 2025) the personal exemption was reduced from $4,050 to $0. The removal of the personal exemption means that overall taxable income has increased for all non-residents. It’s important to note that these amendments do not affect the 2017 (and previous) tax return filing season. So, if you were working in the US on a J-1 visa in 2017, you can still avail of the personal exemption. The removal of the personal exemption means that, for most non-residents, Federal tax refunds will be reduced. From the 2018 tax year onwards, the only reason a non-resident will be entitled to a Federal tax refund is if too much tax is deducted from their income. However, even if you’re not entitled to a Federal tax refund, it’s pretty likely you’ll be entitled to a State tax refund. Our average State tax refund is $175. But remember; to receive your State tax refund you’ll have to file your State tax return. Before you can file your State tax return, you’ll first have to file your Federal tax return! Bottom line? You’re legally required to file a tax return. There’s a great chance you’ll be due a State tax refund. So file your return and claim your cash! (4) How much tax will you pay? From the 2018 tax year onwards, all non-residents must pay 10% in income tax up to $9,525. And if you earn more than this amount on your J-1 program, you must pay 12% in income tax on the amount between $9,525 and $38,700. 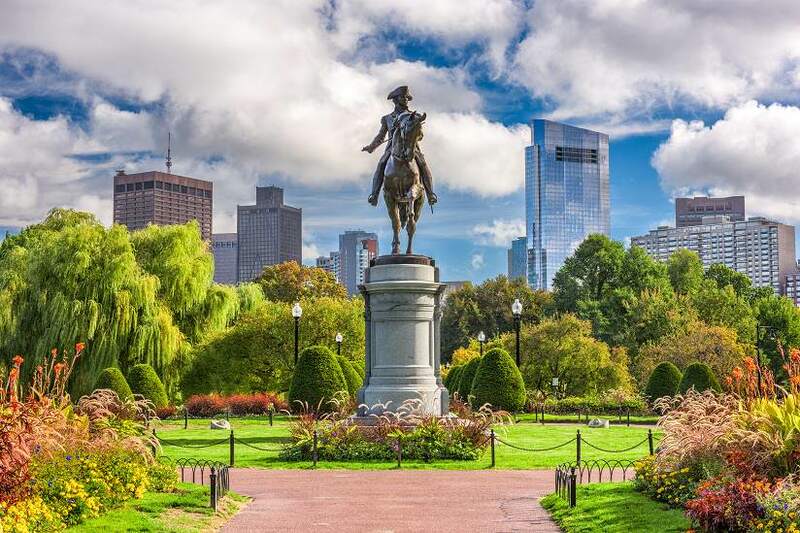 Fred travels to Boston on a J-1 visa to work in a restaurant for the summer. During his time in the US he earns $4,000. If Fred was working in Boston in 2017 he would not have to pay tax on his earnings as his income does not exceed the personal exception amount of $4,050. However, if Fred works in Boston in 2018, he will not be able to avail of the personal exception and must pay $400 (10%) in income tax. Fiona moves to Miami on a J-1 visa and secures work in an office for the summer. During her time in the US she earns $9,000 (the average income for around 50% of all summer work and travel participants). Had Fiona earned this income in 2017, her tax bill would have been $495 ($9,000 – $4,050 = $4,950. 10% of $4,950 = $495). However, if she earns this income in 2018 her total tax bill will be $900. $0 – $9,525 10% of taxable income. Sprintax is the only online self-prep tax software for those on a J-1 programme and non-residents in the US. It will help you prepare your US tax return in minutes! When you create a Sprintax account, our system will assist you in preparing fully compliant Federal and State tax returns. Our software will also enable you to receive your maximum legal tax refund. Sprintax is also the ‘go-to’ tax filing software for numerous major universities in the US including NYU, Columbia, Arizona State University, Illinois Institute of Technology and Cornell. We’re also the non-resident partner of choice for Turbo Tax. Sprintax is a self-preparation tax software that allows J-1 holidaymakers to easily prepare a fully compliant tax return. When you create your account you’ll be asked to enter some relevant information into the software. You can then download your fully completed and complaint 1040NR (non-resident tax return). When you file with Sprintax you file with confidence! Over 500k people have used Sprintax to prepare their tax return and get their tax refund. But don’t forget, most J-1 visa holders are entitled to a State tax refund! Set up a Sprintax account today! Sprintax makes filing your US tax return easy! Filing your US tax return with Sprintax is super cheap and easy. Get started now! 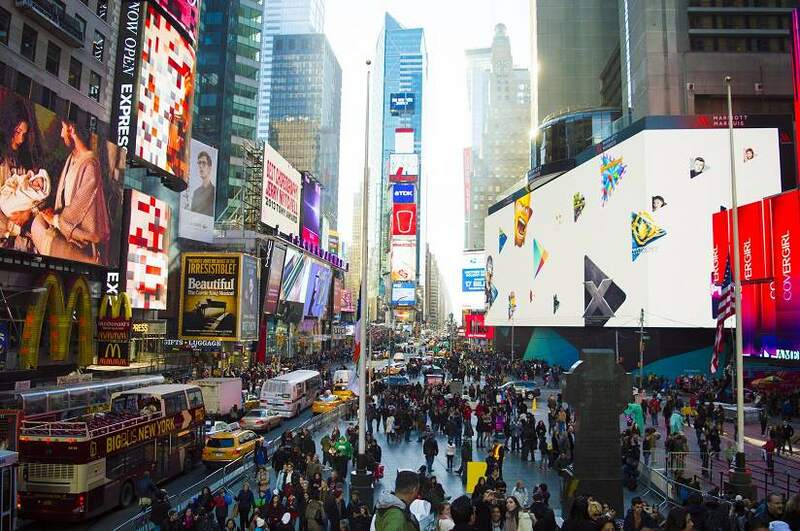 Dreaming of a work and travel trip to the US? Here’s how to turn your dream into a reality!! College semester coming to an end? Striving to find something new? You may be considering venturing on a J-1 US work and travel experience of a lifetime. And you’re not alone. In fact 300,000 foreign visitors travel to the US each year to work and experience ‘the American dream’. 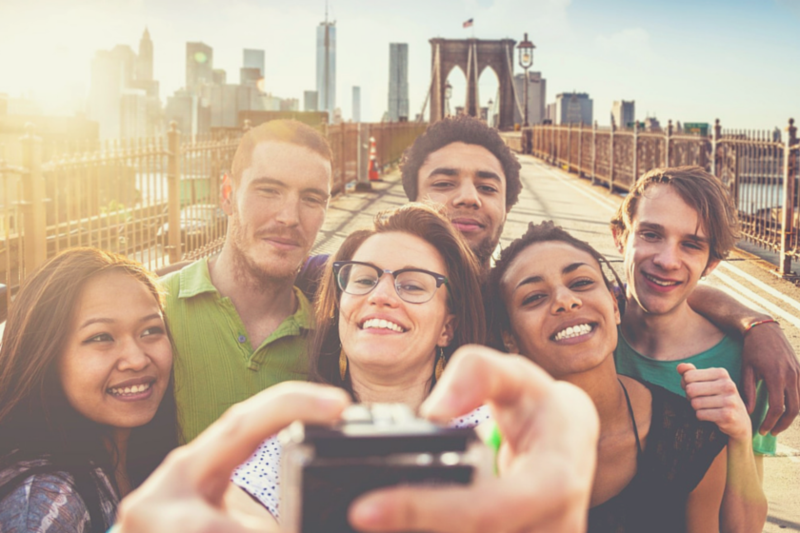 The work and travel program enables university and college students from around the world to spend an amazing summer working and travelling in the US. Participants can gather new knowledge, gain work experience and make new friends. But there’s one downside. For many people, the J-1 visa application process is extremely daunting. Where do you begin? And what if you can’t find a job in the US? Fortunately there are a number of organisations out there that can manage your J-1 visa application for you. Some of them will even guarantee to find you work! Let’s take a look at some of the best options below. Viking have been organizing US Work and Travel programs for 13 years. Their package includes a job offer, issuance of the DS-2019 form, issuance of a round trip airplane ticket to the USA and back to home country, as well as preparation of all required documents for your program. Plus you’ll get free medical insurance to cover your travel period in the US. And all of this is delivered at an ‘affordable price’. Cultural Homestay International (CHI) offer overseas university students a unique opportunity to intimately experience life and culture in the US. Global Current has been a leader in international exchange and professional training for over 50 years. They provide 48 hour processing and ‘unrivaled personal attention’ to each and every J-1 applicant. Cultural Exchange Network (CENET) is a non-profit organization dedicated to cultural and international exchange. Since 1997, CICD has provided more than a thousand students with opportunities to successfully work and travel the US. CICD offers excellent personal service, program monitoring and support. If you’re looking for an unforgettable US experience, Working Adventures Worldwide will help you with all the planning and preparation so that you can get more fun and less stress out of your overseas experience! Their parent company BUNAC (headquartered in Britain) has been in the youth travel industry for over 40 years, specializing in work and volunteer abroad programs. Every year, children across America head to Summer Camp for a summer in the outdoors, experiencing new things and building up their skills. Camps employ international staff to help run the camp, working as Camp Counsellors and Camp Leaders. This is a great opportunity to earn money over the summer while doing something that you love! The best part of this company’s (based in New Zealand) program offering is that they will guarantee you a camp counselor job or your money back! Jobs can be found in all kinds of camp counselor roles including water sports, outdoor activities, land sports, horse riding, life guarding, performing arts, arts & crafts. Based in New Zealand, Camp America have been tried and tested by thousands of Kiwis. With Camp America you’re guaranteed a placement or a refund! This company will be for you if you’re hoping to travel to the US from Australia to work in summer camp. Attracting candidates from all around the world, CampStaffUSA is a one of a kind staffing site that focuses on summer camp employment. The company was founded by camp directors looking for an all-in-one solution for hiring quality summer camp staff. 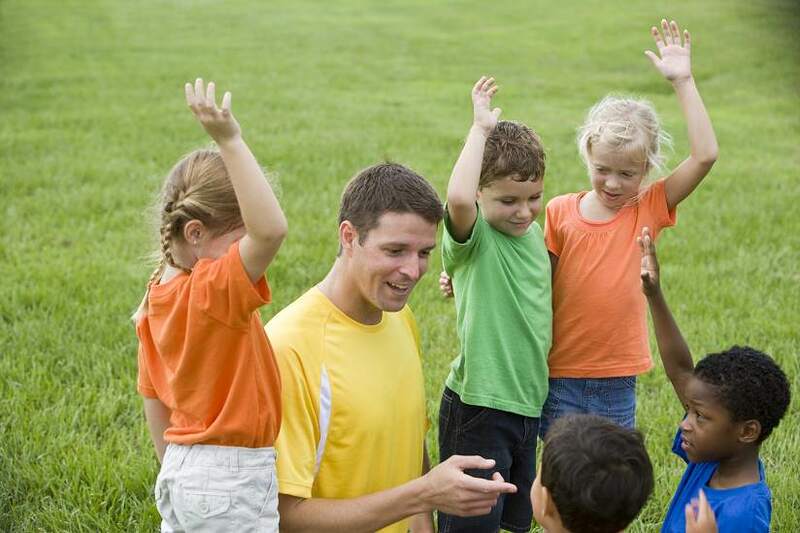 Camp Leaders are the only specialist summer camp company based in Ireland. They provide summer camp placements at over 500 summer camps throughout America. They offer high wages and a truly unforgettable J-1 summer experience. If you choose the American Camp Association for your US camp placement you’ll have an opportunity to pick from 3,656 Camps and 12,184 Programs. The American Camp Association is a community of camp professionals who, for over 100 years, have joined together to share knowledge and experience and to ensure the quality of camp programs. USEH provide high quality paid international internship/training to young professionals from all around the world, specializing in Tourism and Hotel management, business administration, finance, sales & marketing and IT. Since 1980, more than 350,000 individuals (from over 100 countries) have participated in Intrax programs. For over 10 years, IIUSA has helped international students and graduates to find internships in the US. They will help you to find a great internship, get a J-1 visa and find a company for your OPT training. Founded in 1963, Cultural Vistas is a non-profit exchange organization which promotes global understanding and collaboration among individuals and institutions. 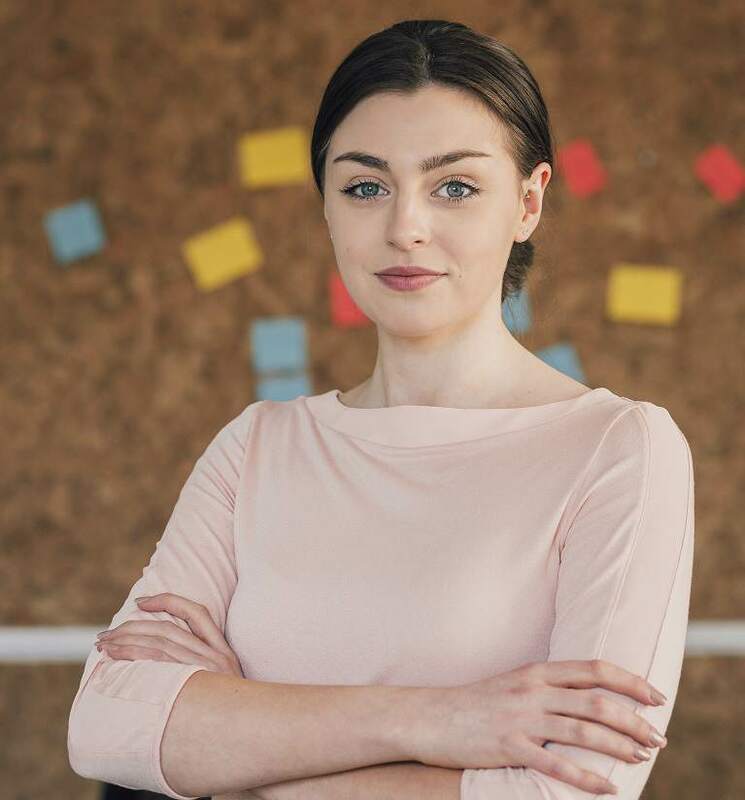 Annually, more than 4,500 individuals and over 900 US businesses, companies, and NGOs turn to Cultural Vistas as their trusted solution for J-1 Visa sponsorship for internship and training programs. Founded in 2008, Career Internship Abroad (CIA) is a world-class educational consultancy firm that creates global internship opportunities for students, fresh graduates, and young professionals. CIA has been recognized by different international regulatory agencies and is affiliated with different educational organizations to ensure that all the participants are protected and secured. CIPUSA offer an array of exchange programs ranging from two weeks to 18 months in duration and spanning a variety of professional fields. Their J-1 Training Visa program is open to both applicants who already have a training program lined up in the US and to those who are still looking for opportunities. This company provides J-1 Visa Waiver Jobs For Physicians, with an emphasis on roles in Montana. With this waiver, you will not be required to return to your home country after the completion of your J-1 exchange visitor program. This is a very desirable factor for many medical doctors that come to the US on a J-1 visa. This non-profit organization helps to connect health professionals searching for jobs in rural or ‘underserved areas’ with health care facilities. 3RNet offer roles in every state! 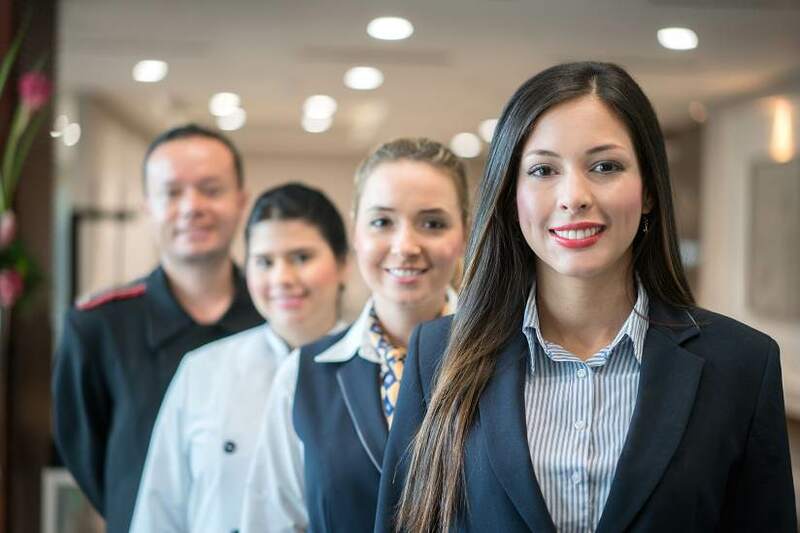 This company specializes in the placement of qualified international hospitality graduates and young professionals into major brand hotels and resorts in the US. They match qualified interns and trainees into paid training positions to receive on the job training, build career experience and improve professional skills. Placement International has over 10 years of experience in offering positions for highly educated students and young professionals to do paid internships and management training programs in the most luxurious hotels and restaurants in the US. Looking to work in a top hotel brands while on your J-1 program? Step this way! 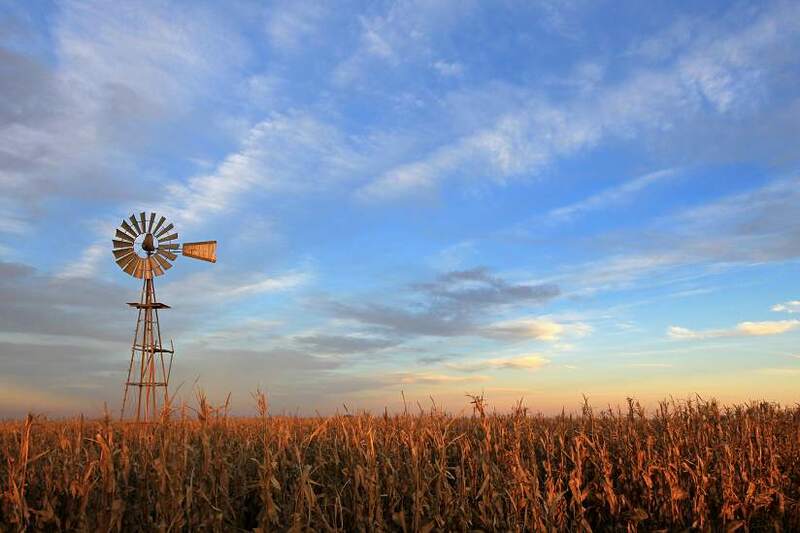 Looking to experience farm life stateside? CAEP brings young adults together from all over the world to share and learn ideas, beliefs, and agricultural practices through international paid agriculture exchange programs. When you’re in the US on a J-1 visa you’ll no doubt be hoping to earn some money to supplement your trip. However as the saying goes – ‘your health is your wealth’! In the US, you’ll have access to quality medical care for any unexpected illnesses or injuries you may encounter during your trip. But this care can be extremely costly without insurance coverage. Tokio Marine HCC can provide coverage in the event of an accident or emergency as you travel within the US. You’ll be back on your feet in no time! I filed an incorrect tax return. What should I do now? The Internal Revenue Service (IRS) knows the tax code is complex, and that people make mistakes. A tax return can be considered ‘incorrect’ or ‘incomplete’ for a variety of different reasons. 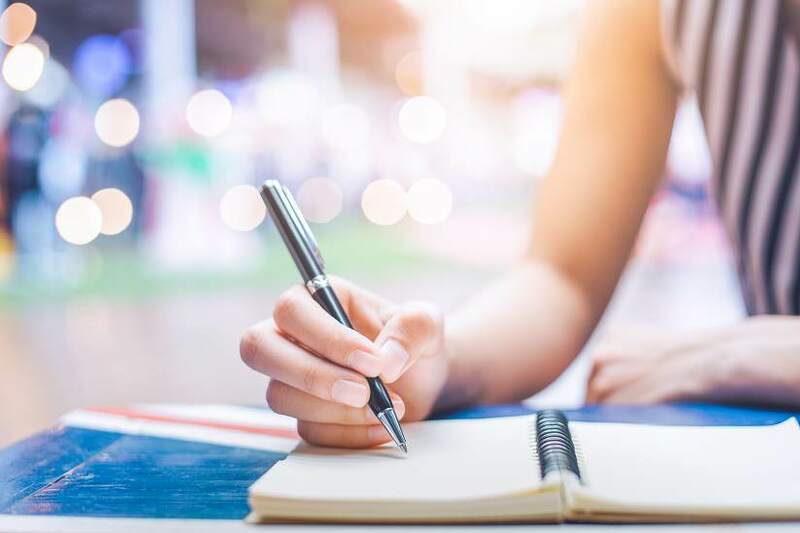 Simple things like forgetting to sign a form to big issues like misreporting income or incorrectly calculating a deduction can all effect the validity of a tax return. 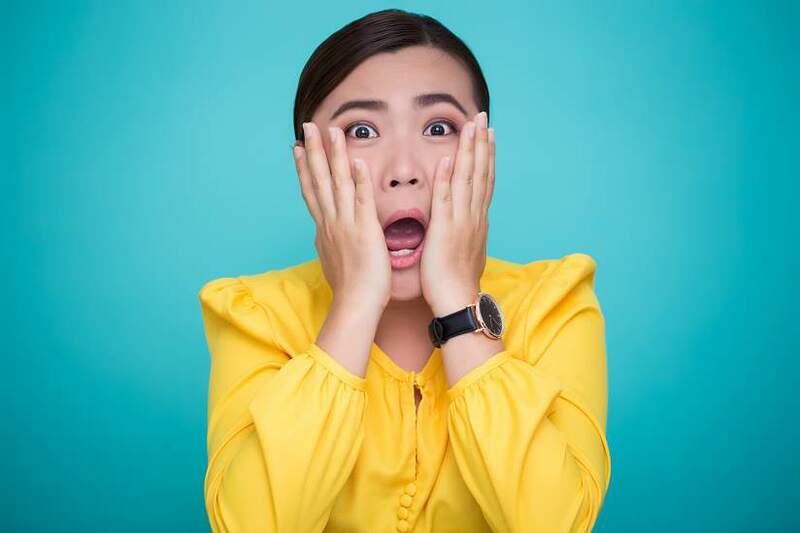 If you realize that you made an error on a tax return you already filed or you have come across new information (for example you received an additional W-2 or 1042-S), simply file an amended tax return to make a correction. It’s very important to note that you should not attempt to correct the situation by filing another original Form 1040NR return. That will confuse things further and may cause additional headaches for you. Instead file a Form 1040X, even if you filed your original return only a few days ago. Need a hand filing your amended tax return? Contact Sprintax today! Correct your filing status – for example, if your filed as single but actually got married on the last day of the tax year, you will need to amend your return by filing his taxes under the appropriate status – married filing jointly or married filing separately (note: non-residents can file only as married filing separately). Correct your income and tax figures because you did not include all your payment documents when preparing your return. If you receive additional tax documents for the tax year, for example, a Form W-2 arrives in the mail after the tax deadline, you would need to file an amended tax return to report the additional income and tax. You should also amend your return to claim all of the allowable tax deductions or tax credits that you did not claim when you filed your original return. In previous years there were a number of deductions that international students could use to reduce their overall tax liability. However, in November 2017, President Donald Trump introduced a GOP tax reform bill which brought widespread tax-related changes for most taxpayers. Check out if you qualify to claim an additional exemption for your dependent here. If you realize that you need to make one or more of the corrections listed above use Form 1040X to amend the federal income tax return that you previously filed. In some cases, you don’t need to amend your tax return. The IRS usually corrects math errors when processing your original return. If you didn’t include a required form or schedule, you’ll receive a request for the missing item needed to finish processing your tax return. When you receive a notice about errors, there will usually be other ways to correct errors besides an amended tax return. Usually, these misunderstanding can be quickly rectified by providing the correct information to the IRS. The notice that you receive will explain clearly what the issue is and how to respond. The Form 1040X is two pages long and you are only required to include new or updated information. You will also find a space where you can write an explanation as to why you are amending your return. It’s very important to ensure you are using the latest version of the 1040X. Once you complete the form, you’ll have to mail it to the IRS along with all required supporting document. Amended returns are only filed on paper. The normal processing time for a Form 1040X, is between 8 and 12 weeks from the time the IRS receives your tax return. If you are amending for more than one tax year, you will need file Form 1040X for each tax year separately. Many people find the prospect of dealing with the IRS and amending their tax return to be quite daunting. If that sounds like you, contact Sprintax today! If you are filing an amended tax return to claim an additional refund, you’ll have to wait until you have received your original tax refund before filing a Form 1040X. Amended returns take up to 12 weeks to process. You may cash your original refund check while waiting for the additional refund. Also you generally MUST file the amended return within three years from the date you filed your original return, or within two years after the date you paid the tax (whichever is later) in order to get the extra refund. If you owe additional taxes with Form 1040X, file it and pay the tax as soon as possible to minimize interest and penalties. If your amended return shows you owe more tax than you reported on (and paid with) your original return, you’ll owe additional interest and probably penalties too. Even though you might be amending a return from one or two years ago, the due date for your original return and for payment has already passed. The IRS may not penalize you for a small mistake, but it sure will collect some interest on the proper amount you didn’t pay on time in the first place. The sooner you correct the error, the less interest you’ll pay. Don’t hesitate to contact the Sprintax team if you need help with amending your return! You might be surprised to learn that, at present, there are around one million international students studying in the United States. What won’t surprise you however, is that each of these one million students have tax obligations in the United States. What are these obligations? This is where things get a bit tricky! If you’re an international student in the US you might not be too familiar with the local tax system. And it’s highly likely that you’ll have some questions about your tax obligations and what you’re entitled to. That’s why we’ve created this handy guide to US tax for international students. 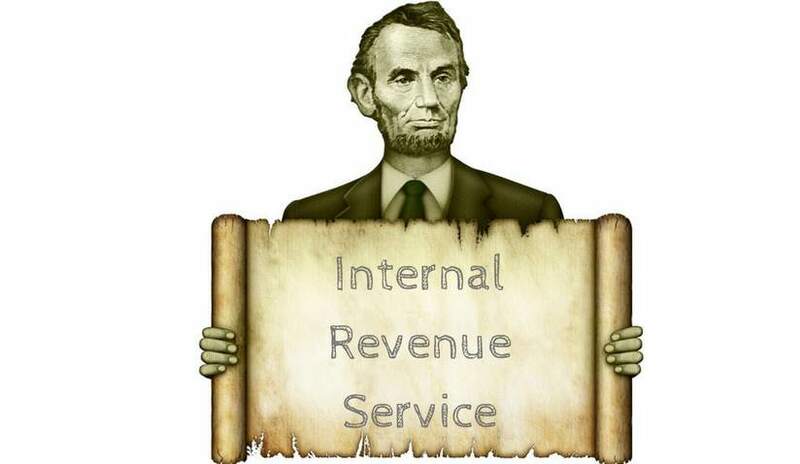 Q – Who or what is the IRS? The Internal Revenue Service (IRS) is the US government agency responsible for the collection of taxes and the enforcement of tax laws. 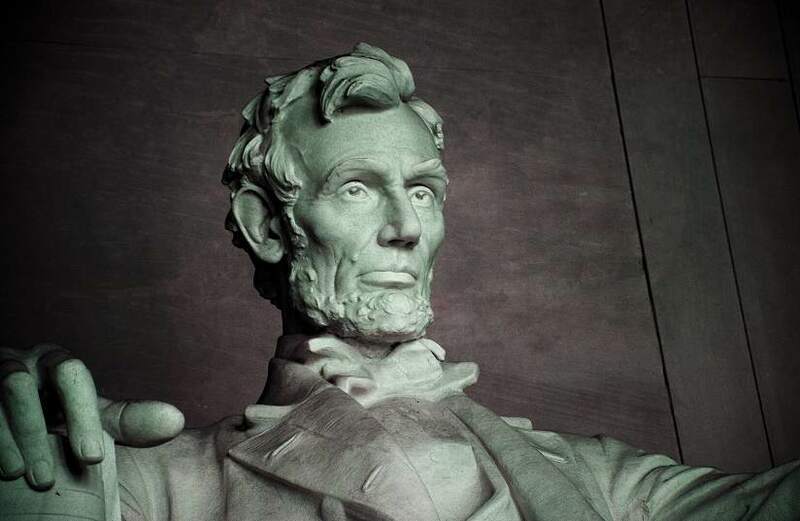 The agency dates all the way back to 1862 when it was introduced by the then President Abraham Lincoln. Its primary purpose includes the collection of individual income taxes and employment taxes. The IRS also handles corporate, gift, excise and estate taxes. 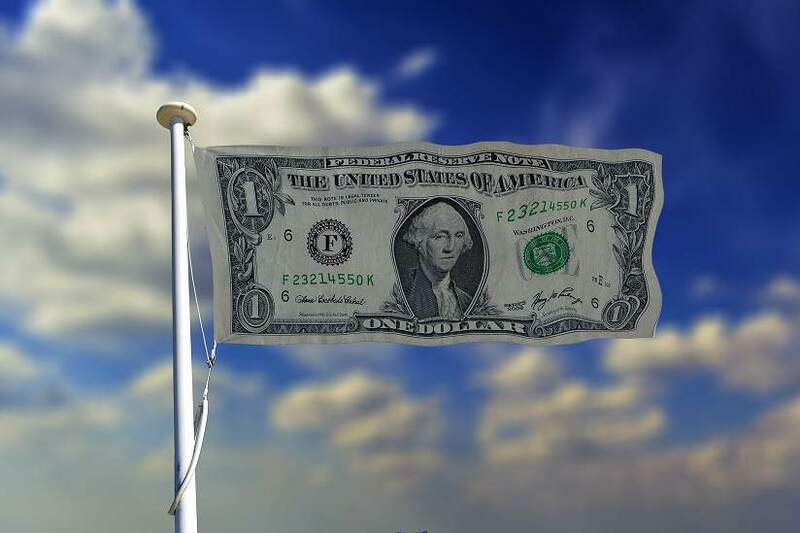 Q – What can you tell me about the American tax system? Both Americans and foreign nationals residing in the US must pay taxes to both the State and Federal government. Usually, when an individual earns an income, a portion of it is automatically deducted and transferred directly to the government. Every January employers send summaries to their employees of how much income they were paid as well as how much of their income was sent to the IRS. Q – What income will I need to pay tax on in the US? Q – How do I know if I made ‘US source income’? 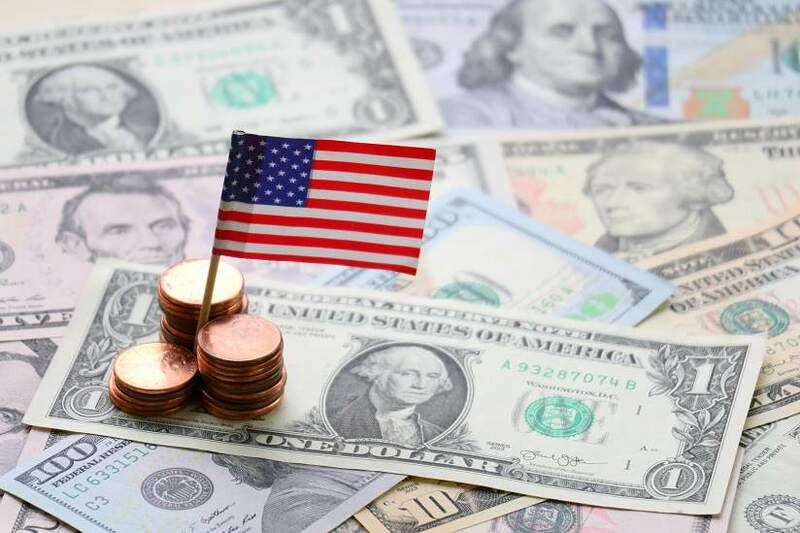 US source income is defined as wages from a job in the United States, received scholarship money from an American organization, or made interest on money in an American bank account etc. Q – What is an Income Tax Return? An income tax return is the form that individuals and business submit to the IRS in order to file their taxes. 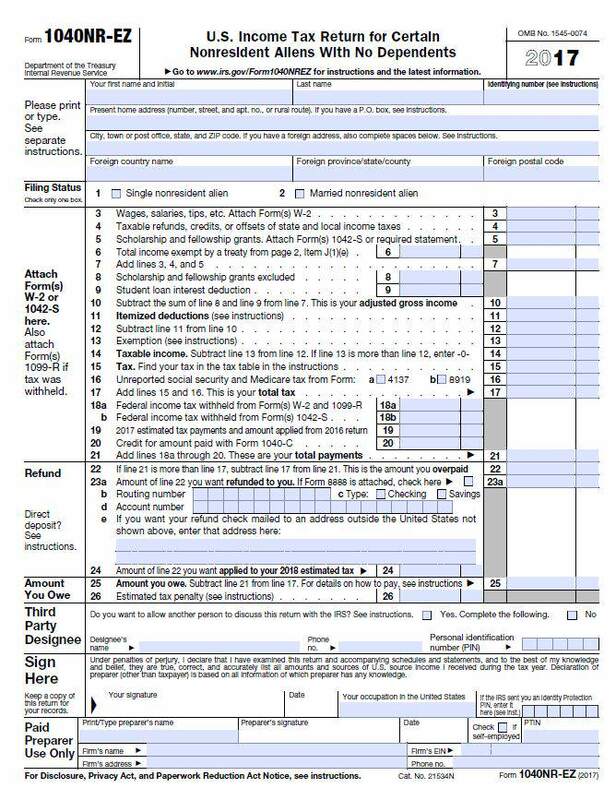 ‘Form 1040 NR’ and ‘1040NR-EZ’ are all examples of income tax forms. The purpose of filing your tax return is so that you can report all sources of your income to the government – including the tax you have already paid and what you still owe. It’s also an opportunity to claim any deductions or exemptions that you may qualify for. At the end of the process, you calculate the total tax you should have paid. If you paid more than what you owe during the year, you will be reimbursed. On the other hand, if you didn’t pay enough, you have to pay the difference. Q – Am I required to file a tax return? Yes. 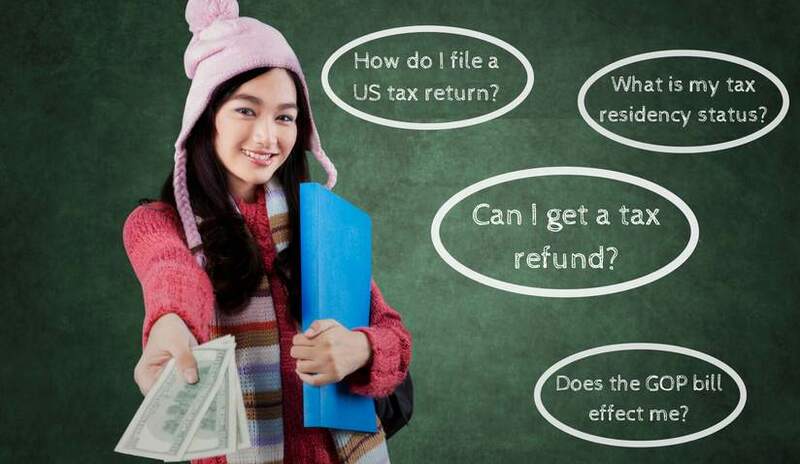 Every international student inside the United States must file their tax return each year. Q – What is tax residency status? 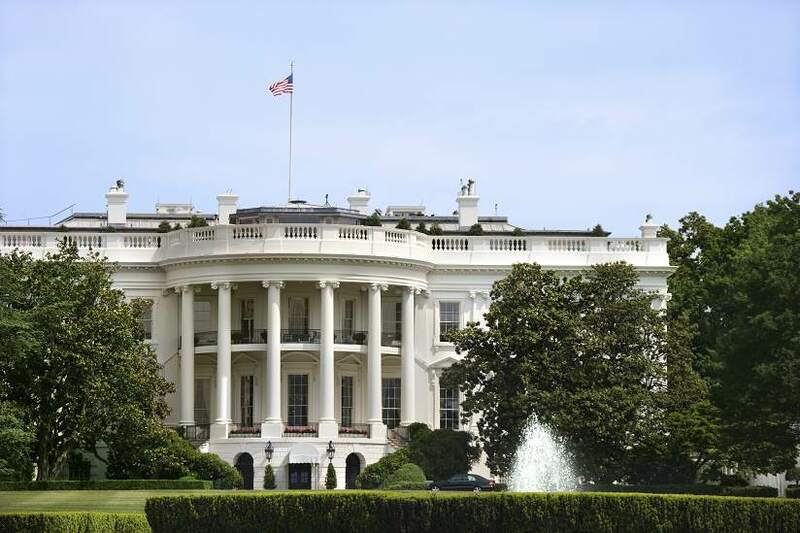 US residents have differing tax obligations depending on their relationship with the country. Each taxpayer must determine their own residency status before they file their tax return. The most common tax residency statuses are ‘resident’ and ‘non-resident aliens’. Q – How can I work out my residency status? Most international students who are studying in the US on F, J, M or Q visas are considered non-resident aliens for tax purposes. International students on F1 visas are automatically considered non-resident aliens for their first 5 calendar years in the US, and scholars (and their dependents) on J visas are automatically considered non-residents for their first 2 calendar years in the US. If you’ve been in the US for longer than the 5 or 2 calendar years, you will be considered a ‘resident alien’ for tax purposes if you pass either the ‘green card test’ or the ‘substantial presence test’ for the calendar year (January 1-December 31). Q – What is a substantial presence test? Sam was present in the US for 120 days in each year from 2015-2017. To determine if he passes the substantial presence test for 2017 he can count his full presence in 2017, 40 days in 2016 (1/3 of 120 days), and 20 days in 2015 (1/6 of 120). Since the total for the 3-year period is 180 days, Sam will not be considered a resident under the substantial presence test for 2017. Q – What tax forms do I need to file? 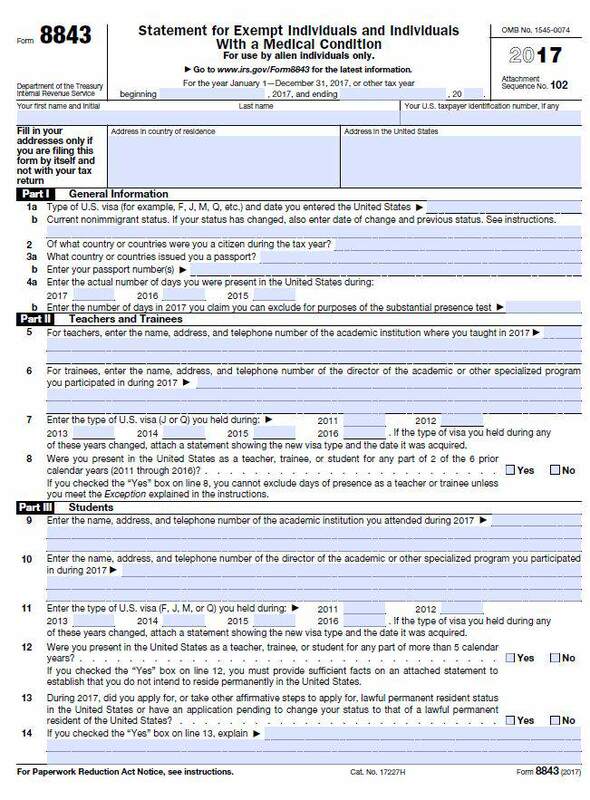 Every international student, will need to file a Form 8843 (which essentially proves that you’re a non-resident) and if you have received income in the last calendar year then you will most likely need to file a Form 1040NR-EZ also. The 1040NR-EZ is used to declare your US source income and determine how much tax you owe on that income. It’s a simplified version of the 1040-NR and most international students can use it. Q – What information will I need in order to complete my tax return? The first thing you will need is your US taxpayer identification number (TIN). A US TIN for an individual is either a US Social Security Number (SSN) or an individual taxpayer identification number (ITIN). Only foreign nationals who are authorized to work in the United States under the US immigration law are eligible to apply for a SSN. Foreign nationals not eligible to apply for a SSN may submit a Form W-7 ITIN application to the IRS. Confused? Learn more here about ITIN. 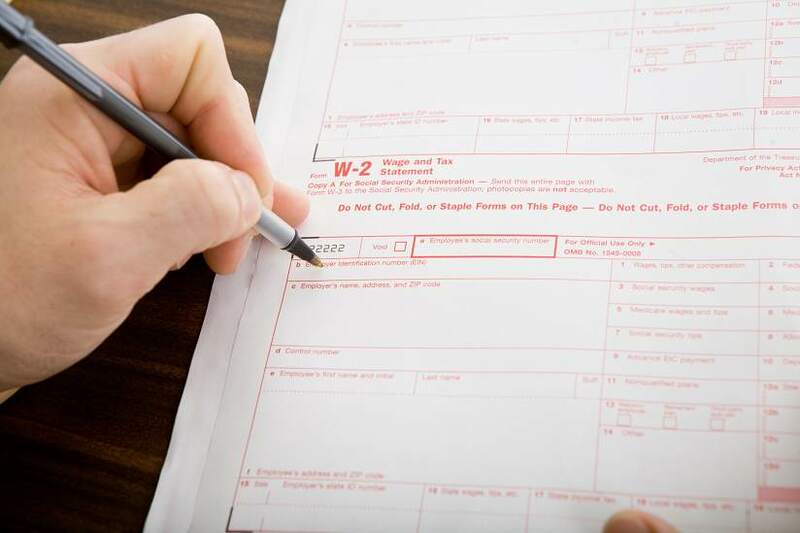 To prepare your tax return you will also need your income documents like W-2’s, 1042-S’s, and/or 1099’s, which will be mailed to you by the university and your employer. W-2 – This document, provided by your employer, includes details of the wages you earned and the taxes withheld from your wages. You should receive this document by January 31. 1099 – This document is a report from your bank on the interest you have earned on your accounts. You should receive this by January 31. 1042-S – This details wages paid to you if you already claimed a tax treaty benefit, and scholarship income that was used for expenses other than tuition and fees (such as room, board, or travel). You will receive this by March 15. Don’t forget – if you don’t have taxable US sourced income you won’t receive income documents and you won’t need to apply for a US TIN. In this case you’ll just need to submit Form 8843 to the IRS. Q – How do I submit a tax return? You can choose to fill out all of the paperwork and submit your tax return directly to the IRS yourself. Depending on the tax rules of the state in which you lived and /or worked you may also need to file a state return to your state tax office. Alternatively, many international students find the thought of submitting a tax return to be quite daunting. If you’d like a hand with the preparation of your return, you can enlist the help of a tax agent like Sprintax. Preparing your tax return is easy with Sprintax and we guarantee to keep you compliant with the US tax authorities. Q – How can Sprintax help me? Sprintax will take the stress out of filing your tax return by offering you step-by-step assistance throughout the entire process. Sprintax can also help you to determine if you are considered a ‘resident’ or ‘non-resident’ for tax purposes and guarantees to maximise your tax refund. Just complete the registration form here to get started. Q – What is the deadline for filing a tax return? The filing deadline for US federal income tax returns for individuals is April 15. However, in the event that this date falls on a Saturday, Sunday or holiday, the first succeeding day that is not a Saturday, Sunday or holiday will be the deadline. Q – What should I do if I am unable to file my tax form by the deadline? Need more time to complete your return? 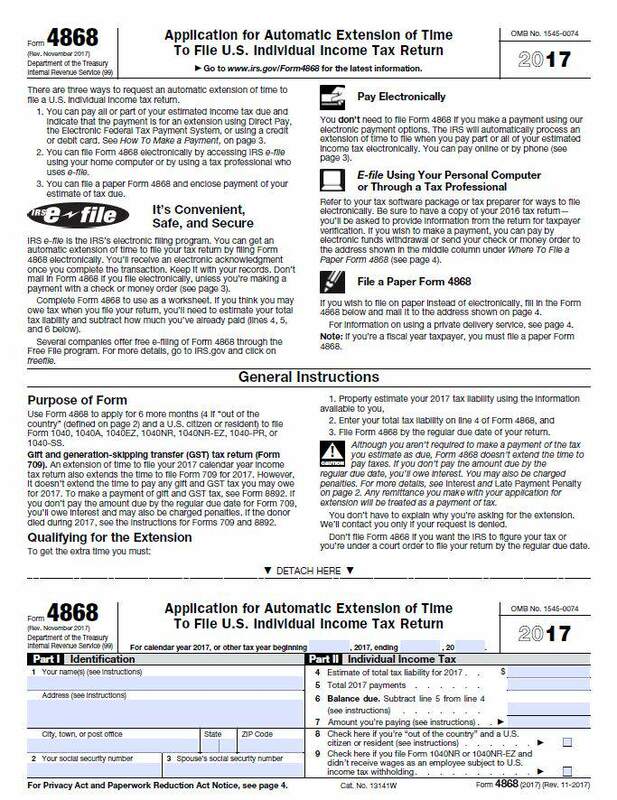 Simply file a 4868 to request an automatic deadline extension to August 15. It’s important to note that you will not be notified if your extension request is approved – the process is automatic. If you owe any taxes, you must still mail the estimated tax payment by the April 15 deadline or you will have to pay penalties and interest on any payment owed. Q – Does it cost anything to file my tax return? If you decide to file your tax return yourself, the process is free. Q – Am I entitled to any tax exemptions? 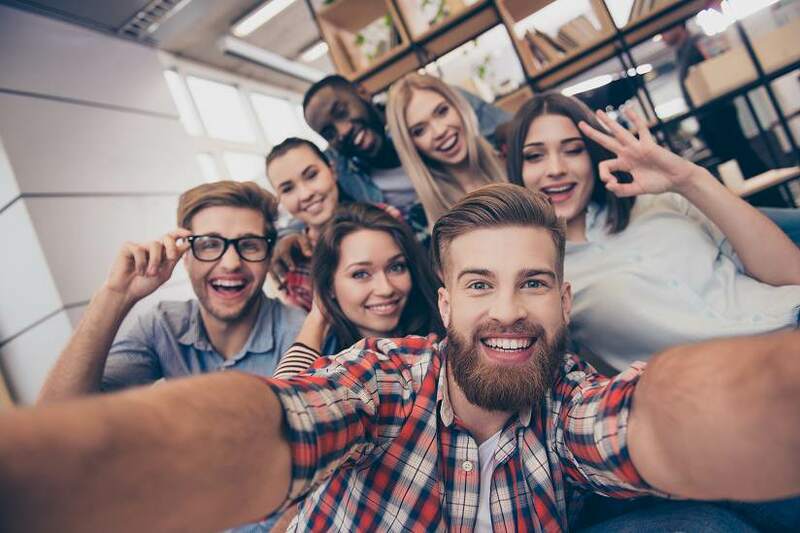 In previous years there were a number of exemptions and deductions that international students could use to reduce their overall tax liability. However, in November 2017, President Donald Trump introduced a GOP tax reform bill which brought widespread tax-related changes for most taxpayers. Check out our detailed article about the GOP Tax Reform and its effects on the taxation of foreign students and other non-resident aliens here. 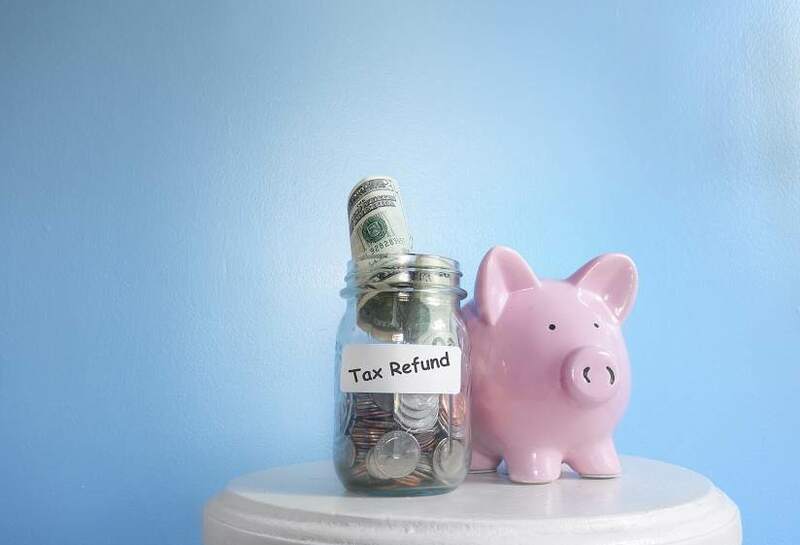 Q – Will I be entitled to a tax refund? 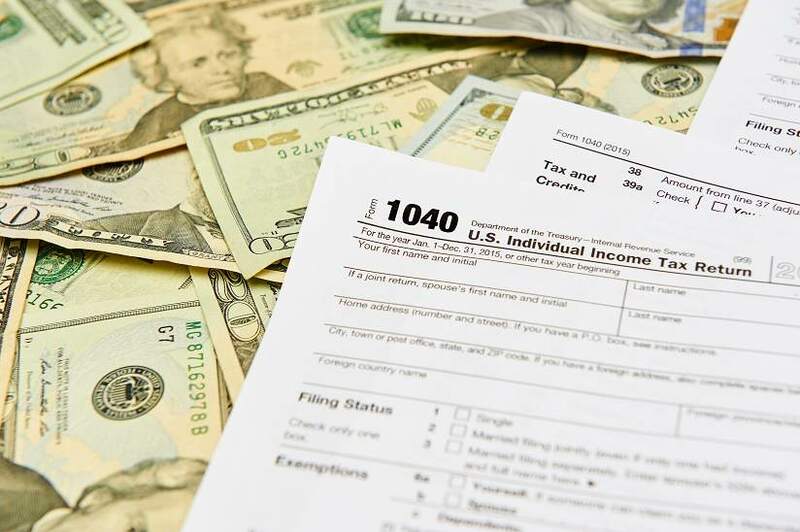 You may be entitled to a tax refund if you paid more than what you owed during the year. Once you’re tax return has been completely filled in you will be able to determine if the US government owes you a refund. Sprintax can help you to you to retrieve your maximum tax refund. Q – How can I claim my tax refund? You can claim your tax refund when you file your tax return. Alternatively, if you choose to file with Sprintax, you’ll be guaranteed to receive your maximum legal tax refund. Q – Do I have to pay taxes on income I received from my home country? No. The US will not tax your income from non-American sources. Q – There is a tax treaty between the US and my country. Should I file a tax form? Yes. You will still be required to file a tax return for each year you spent studying in the US. Q – I’m an F-1/J-1 student with no US income or scholarships for 2017. Do I need to file anything? Yes. You are required to complete a Form 8843 with the IRS regardless of whether you received income. Q – I arrived in the US in December and I didn’t work. Do I still have to file Form 8843? Yes. Every non-resident alien who spends any portion of the year in the US on an F or J visa must complete a Form 8843 and send it to the IRS. Q – What happens if I don’t file a tax return? Payment of an income tax liability is required by law and complying with US tax law is one of the conditions of your visa. If you owe taxes and don’t file, the IRS can impose penalties and interest and there can also be consequences for future immigration. For instance, if you apply for permanent residency (a green card) it’s likely that you will be asked to provide evidence of your tax filing for previous years in the US. Filing a tax return is also the only way you can retrieve your tax refund. It would be a shame to leave money you’re entitled to behind! File your return with Sprintax today! Phew! Tax season is finally over! But what should I do now? When tax season ends it can feel like a big weight has been lifted off your shoulders – an opportunity to exhale and relax (until it all starts again next year that is!) But before you expel all tax topics completely from your mind, there is one final task you must complete. Carefully store all of your tax records! It’s very important that you organize and store all of your tax records and documentation – including a copy of your tax return. If you’re ever selected by the IRS for an audit you will need to have access to your tax returns and the documents you used to complete them. If the IRS does audit you, they’ll generally look back at your returns over the previous three years so you’ll want to have copies of the returns you filed for those years close at hand. You’ll also need your W2s, 1042-S’s, 1099s, receipts, or any paperwork that will support your tax deductions or credits that you may have claimed on those returns. After you file your tax return, you may discover that you need to amend it due to an error or a tax break that you should have claimed. 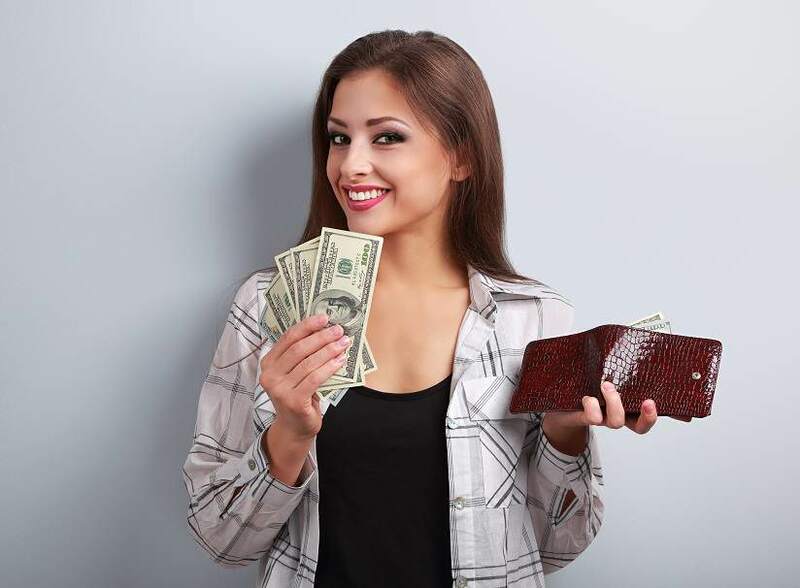 In such cases you will need a copy of the return you filed along with all documents (such as your W-2, 1042-S, 1099) and supporting information (like receipt and statements) you used to prepare the return. Good tax record keeping will also be useful if you decide to apply for permanent residency (a green card). During the application process you will need to provide evidence of continuous compliance with the US tax law by enclosing the tax return(s) you’ve filed. Tax returns you have filed in previous years can help you in preparing future tax returns. For example, you may need to refer to previous figures like refund amounts, deductions, or tax due etc. According to the statute of limitations outlined by the IRS, the basic rule is that you should keep all of your relevant tax documents for at least 3 years after the date in which you filed. In other words, if you filed a return in 2017 you should keep all tax documents relating to it safe until 2020. In some cases, you may need to hang onto your records for longer than three years. 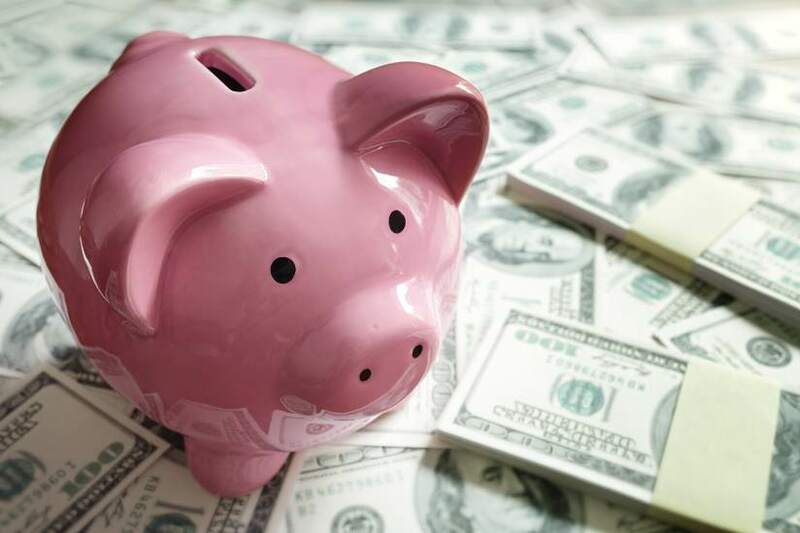 For instance, you should plan on keeping tax forms for retirement accounts such as IRAs for seven years after the account is completely wiped out. Additionally, if you buy or sell property, you should keep property records until the statute of limitations expires for the year in which you dispose of the property. Our advice? Keep all your US tax records at least until 3 years after you have left the US! How to keep tax records? The law doesn’t require any special record-keeping system for all taxpayers. You can keep your records in any manner that works best for you. If you plan on keeping your records for a long time you should consider scanning your documents and keeping a backup of the files. All international students and scholars in the US are required by law to file a tax return. Sprintax can help you to do exactly that. Our easy-to-use system removes all of the stress from the tax filing process. Plus we’ll even help you to retrieve your maximum legal tax refund! Missed the April 17th deadline? Don’t panic! Nearly 30% of taxpayers are unable to organize their documents before the deadline. But you can still fix this! 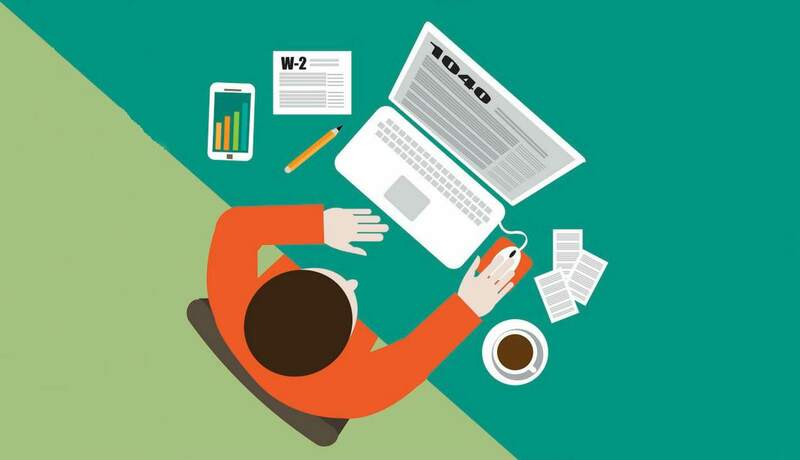 Here are a few important things you should consider if you missed the tax deadline. If you’re entitled to a refund or your tax return shows no tax liability, you may not be fined for filing late. If you’re due a refund, you should file as soon as possible to get it. You may be entitled to a refund if you had too much tax withheld from your wages or you qualify for certain tax credits. Sprintax will help you determine if you are due a refund. It’s important to note that there is a time restriction on claiming a federal tax refund. So, if you don’t file within three years from the due date of your tax return (17th of April, 2018 for 2017 tax year), you may not receive your refund. In addition, there are some tax refund policy changes for late filing taxpayers that the IRS is implementing and these may affect how quickly you will receive your refund. If you have underpaid tax, keep in mind that both late filing and late payment penalties may be charged on top of your tax liability. The failure-to-file penalty is the bigger portion of your penalty, and after 60 days of delay its minimum amount will be $205. So if you have not filed form 4868 – Extension to file – you may need to submit your tax return to the IRS as soon as possible in order to avoid a further increase of your fine. Your failure-to-pay penalty will depend on the amount of tax you owe. The percentage of the penalty increases over time, so even if you are not ready with your documents, the more tax you pay on time (before the deadline) the less interest and penalty charges you will accrue. If you are unable to pay your tax on time, you can choose to enter into installment agreement with the IRS. There are certain conditions you will have to meet and Sprintax tax experts can help you if you choose to request an installment agreement from the IRS. If you missed the deadline, the best thing you can do is to prepare your tax documents and file your tax return as soon as possible! Sprintax can help you to prepare your tax return and determine if you’re entitled to a refund. Most international students studying in the US have been granted entry into the country on an F-1 visa. This visa allows students to attend college, university, conservatory, high school, elementary school, and seminary or language school in the US. If you are studying in the US on an F-1 visa, once the study program is finished, you will have 60 days to depart the country, get a new visa or otherwise validate your stay in the country. If you would like to stay in the US after you have completed your program, the first possibility you should consider is the Optional Practice Training (OPT) program. OPT is a program that allows international students to work in the US after their graduation, and gain practical experience. 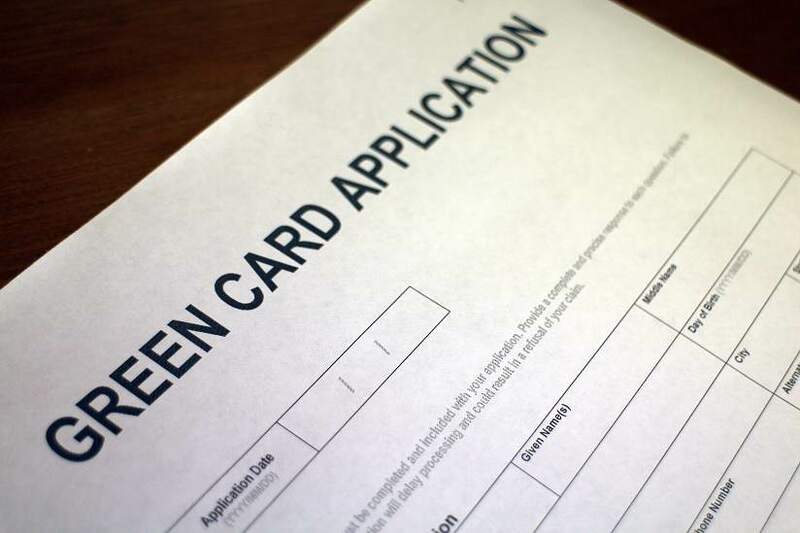 Students with F-1 visas may apply for 12 months of OPT after each level of education complete. For instance, after completing their bachelor education, students can apply for 12 months of OPT, and then for another 12 months after the completion of their master degree. Science, Technology, Engineering and Mathematics (STEM) graduates have the option to extend their program by 17 months (to total 29 months). 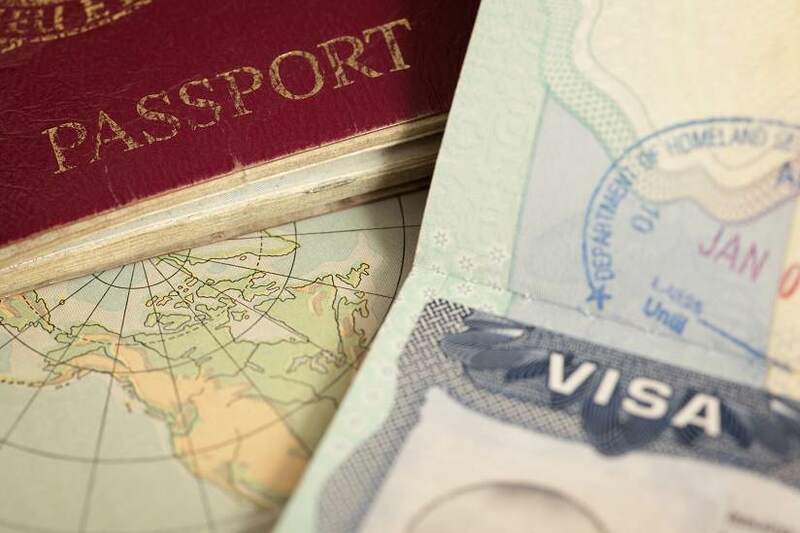 While you participate in your OPT program, you do not need a new visa. OPT program participants are treated as F-1 status holders. Another option available to you is to change your visa status to H-1B by applying for an interim OPT phase before H-1B, or to apply for H-1B directly from F-1. H-1B Specialty Occupations is a non-immigrant visa that gives graduates temporary employment authorization in high-skilled occupations. H-1B applicants are required to have specialized knowledge and a bachelor’s degree or higher (or its equivalent). Most H-1B jobs are in industries such as science, engineering, and information technology. 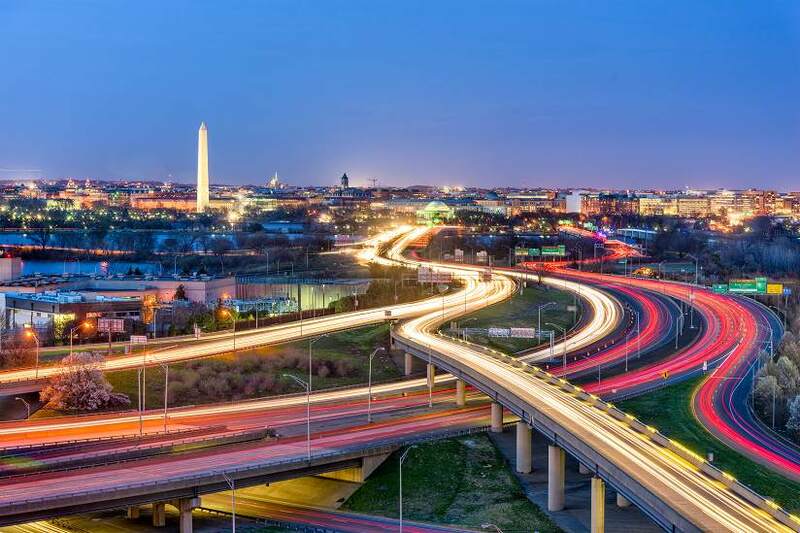 Under this visa you are allowed to work in the US for initial period of three years, and you may apply for an extension which, if your application is successful, will entitled you to a further three years in the US. Plan ahead and try to secure a job or an internship as soon as possible so you have time to prepare all of the required documents. You can even start looking before your graduation, and by doing this you can be sure that you have explored all available options. You are allowed to choose your OPT start date. Keep in mind that with OPT status you can stay in the US for 90 days while unemployed, and the 12-month work period begins on the start date you choose on your application. Building connections is also very important when you are looking for an internship or a job. You never know how the person you met yesterday can help you in finding the perfect job tomorrow. Therefore, go out, attend different events, and make connections that may turn out to be very effective. Career forums can be quite useful so give them a chance! You will get to meet people representing different companies and sectors, and you can be introduced to other people that can offer you exactly what you have been looking for.